At Reborn Renovations, we believe in delivering a basement development that caters to your lifestyle and delivers the look you envision. 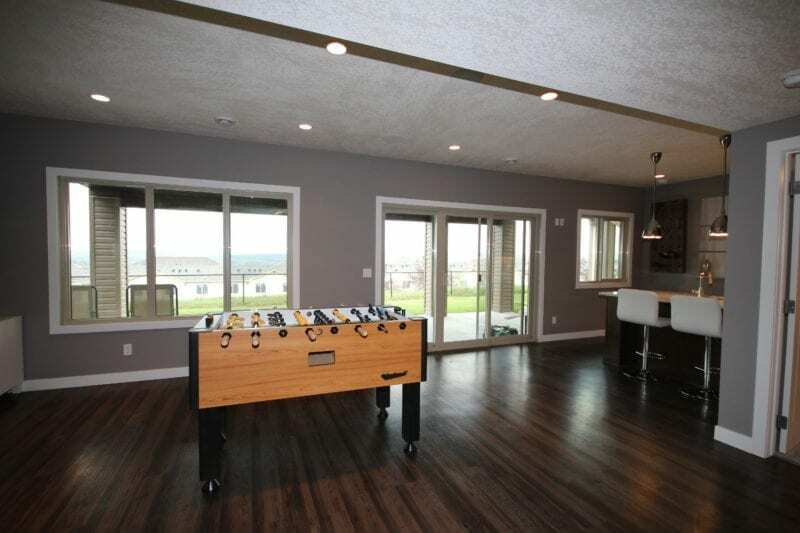 We one of the top rated basement development companies in Calgary and also serve Okotoks and Airdrie. 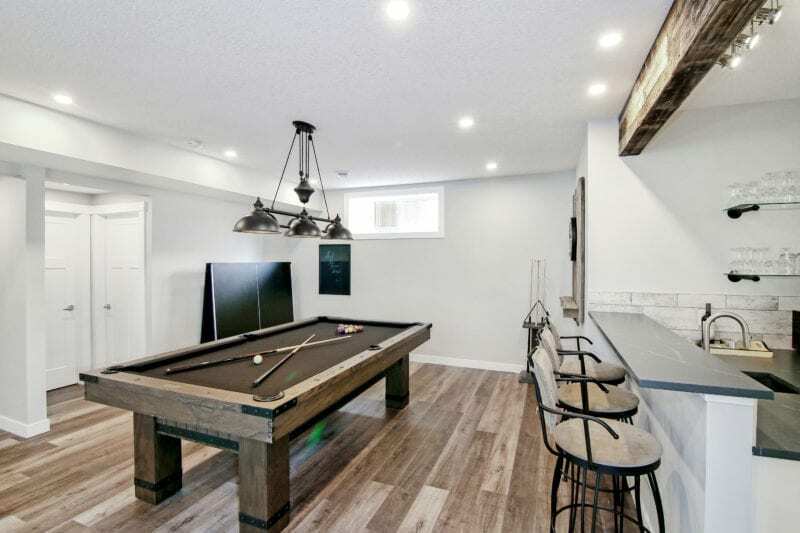 Our team of Calgary basement developers understands that households require usable space in their basements. Therefore, we will conduct an in-depth consultation session understanding your distinct needs and delivering accordingly. Be it a bar, cellar, library or game room, our experts will create a design and layout that ensures the most efficient usage of space. With our services, you will be able to renovate, customize and complete your basement to your complete satisfaction. Your basement is the perfect canvas to translate your aesthetic vision into a reality. With a functional basement you can explore endless possibilities. Regardless of your needs, our experts will help you in designing the perfect basement that caters to your individual needs. Call us now and schedule an appointment with one of our experts for a free quotation. We offer a full range of basement development options from basic development of small spaces, to full custom basement packages. Our estimators have vast experience with basement systems, they will provide a detailed inspection of your space to be developed, listen to all of your ideas and offer the best possible plan to suit all your needs. With almost every basement we visit, we find everything from minor tweaks to the mechanical layout that should be cleaned up for a better finished product, to more extensive rework of where the original builder left off. Things like incomplete mechanical rough ins, poor ductwork planning, envelope issues, improper insulation and vapor barrier, incomplete framing of exterior walls, etc ., are all things our experienced sales team are trained to look for. Reborn strongly believes in reporting these types of things to our clients at the first meeting, which gives them all the information they need to understand the complete scope of work required to develop their basement. From the initial sales consultation, to the design stage through to completion, time and time again We proudly deliver professional workmanship and service to our clients. 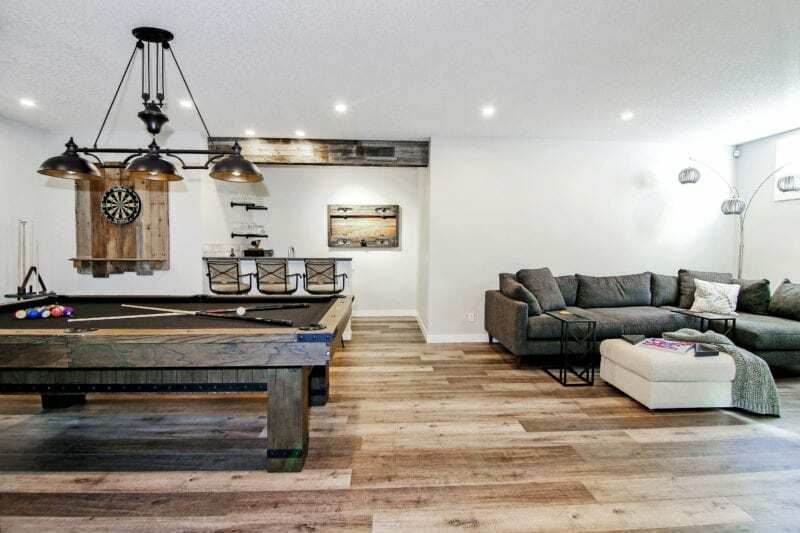 Reborn’s Calgary basement renovation packages are similar to new developments, except for one crucial phase of work; the quintessential demo and rework of the previously developed area. In order to get to a clean slate for renovating a previously developed basement, careful and meticulous demolition is required. This often involves not only demo specialists, but also our mechanical and structural team members that work together on site to safely trace back the steps of the previous development. In the best situations, a professional has previously renovated the space, and the rework is limited to clean and easy tear outs, updating to new code requirements, replacing normal wear and tear items, and upgrading particular areas to reflect new technological and aesthetic advances. 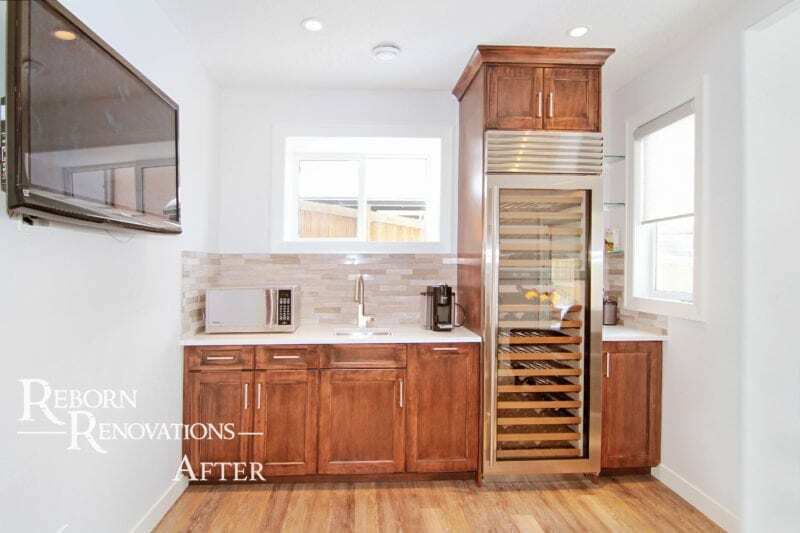 Reborn is known as one of the best rated Calgary basement renovation companies. When our highly experienced sales team comes to provide the estimate, they watch for red flags, and fully explain the issues to you. If any significant red flags are spotted, Reborn consults with its production team of professional tradespeople, and if necessary, has them visit the home for a closer look. 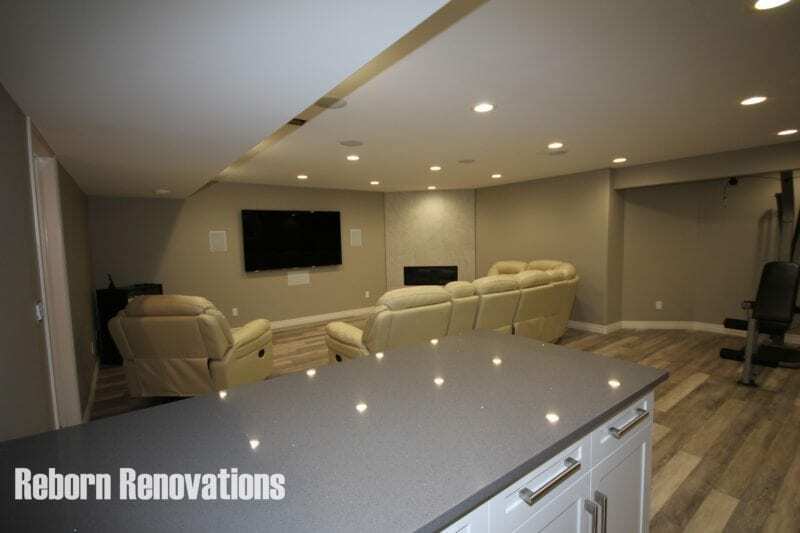 Our extra attention to detail and forthright disclosure to our clients are just two of the many essential qualities that make us the best fit for your basement renovation project. Call or contact us today for a free estimate on a basement renovation in Calgary, Okotoks or Airdrie. Basements are no longer the dark dungeon of storage – they are a wealth of extra living space and a huge return on your home investment! 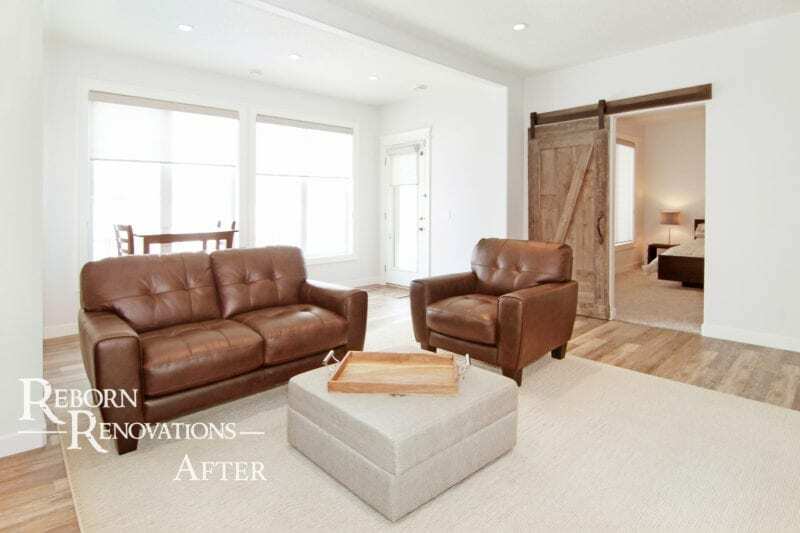 We can transform your basement into functional and enjoyable living space. Reborn offers full basement design services. Our designers know how to create a design that will not only fit your lifestyle and budget, but also create a basement design that suits your personality. We can provide for you with 3D layout drawings of your space, ensuring our basement design is exactly what you have envisioned. Whether you are considering a budget friendly basement renovation, or have decided to pursue a large scale basement development, our experienced team of designers has you covered. Looking for basement renovation ideas? Check out our gallery below. Wet basements can be caused by a variety of reasons. This includes leakages in the gutter, weather changes, foundation failure, or bursting of pipes. At Reborn Renovations, our basement waterproofing contractors understand the underlying causes that result in basement leaks and offer targeted solutions for your utmost benefits. Our experts can easily inspect and estimate solutions for exterior basement waterproofing and interior basement waterproofing, leaving you with a dry, leak free basement. At Reborn, we find that most of our clients select elements from all of our options, making a truly customized fit for all their needs. Although it is tempting to create gimmicky theme-packs, these foot-in-the-door sales tactics are not our style. The truth is that simplified basement renovation quotes rarely reflect the complexity and diversity of basement development and renovations. We prefer an old fashioned full disclosure, open ended conversation about all your options, needs and wants. Our comprehensive in house quoting software system allows us to take all the data from our preliminary meeting, and enter it into the system for an exact basement development cost, subject only to your final selections (exact tile, carpet, plumbing fixtures, etc.). From there we can easily modify and customize options and give speedy feedback on how your new ideas may affect the price of the job. Our team listens attentively to all of your needs and caters elements from entry level all the way to luxury to suit your family’s needs and budget. Fill out the form below or call us today for a free estimate.